Lakeside Pergola, Gazebo, or Pavilion? Outdoor structures by the lake can provide shade, protection from the elements, and a place for outdoor entertainment. The question is, which one is the right for you? Let’s clear up the confusion surrounding these commonly mistaken architectural structures to make sure that you know the difference between a pergola, gazebo and pavilion for your lakeside property. At first glance, important subtleties may not be evident but there is always a way that you can tell what type of structure you are looking at. Some cues that you can look for are the shape, style, and functional purpose. The pavilion is an architectural structure that became well-known in the 1800’s. Originally intended to be the host of entertainment and other activities, pavilions have served a multi-use purpose for centuries. The size of these structures can vary widely and are often reserved for lakeside parties, weddings, banquets, and other events. Pavilions typically have roofs that are similar to a house. Imagine a house without any walls! 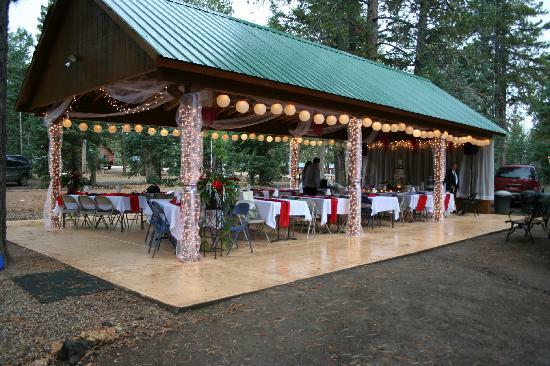 They are often used for venues, picnics, and outdoor weddings. It could be temporary or permanent and might even change its form and function. Gazebos are also quite popular in parks and backyards by the lake. They can transform the look of your backyard with a relatively small investment. Once you enjoy your first dinner outdoors in the comfort of your own patio, you will be glad that you made this decision! The main difference between gazebos and pergolas is that gazebos ALWAYS have a round shape. This is a quick and easy trick to tell them apart! 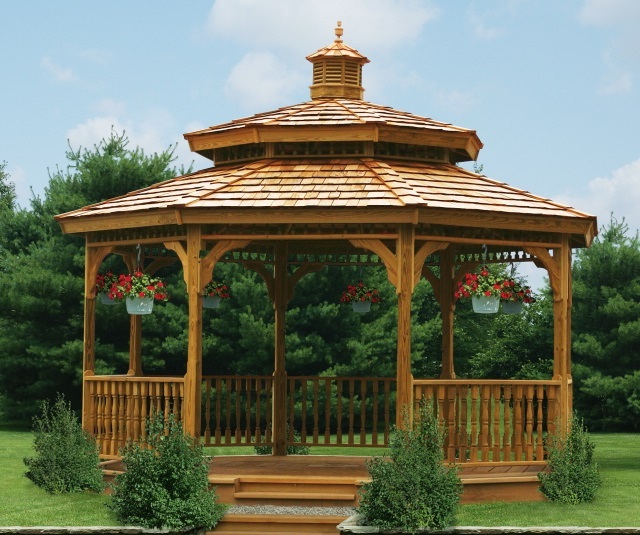 Gazebos are shaped in the form of an octagon with a domed roof that is supported by 8 symmetrical pillared columns. Furthermore, pavilions are much larger than gazebos which are ideally designed to accommodate a small lakeside gathering of anywhere from 5-15 individuals. Pergolas are used to cover walkways and to provide shelter for lakeside seating areas. Rectangular shapes and four legged structures are characteristic of pergolas. One of the easiest ways you can point out a pergola is by its roof. Typically consisting of horizontal planks of wood, Pergola roofs are most commonly flat and open. 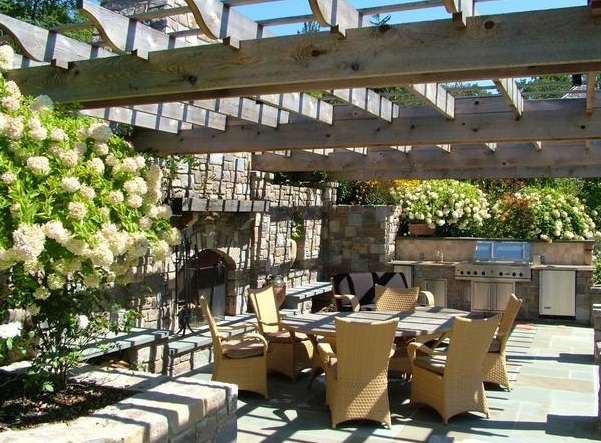 Many times, these structures are used in gardens or adjoining homes to create an elegant outdoor setting. Bookmark this article Lakeside Pergola, Gazebo, or Pavilion?